Online safety is of paramount importance at Hallfield. All staff are trained in necessary Safeguarding and Child Protection procedures, including recognising the potential risks that modern technology can present to our pupils and the responsibility we hold to educate them about accessing modern technology safely. Pupils at Hallfield benefit from ongoing learning about using technology responsibly, but have also experienced expertly led online safety lessons provided by a leading child protection company. Partnerships with parents around online safety education is crucial. Every year we invite parents and carers to attend professional delivered Online Safety workshops to help advise on the best ways to safeguard their children. The presentation from the parents workshop on 31 January 2018 is available below. If you have any online safety concerns (for example, if your child has been a victim of cyber bullying or inappropriate behaviour on the internet) they can be brought to the school's attention via the school office. You can use the “Useful Links” section on this page to visit the Think You Know website. Here you’ll also find links to the CEOP website, and a quick link to Report Abuse via the CEOP network. These couple of videos introduce parents to Online Safety. The world changes. Children don't. What would the story of Romeo & Juliet look like in the present day? Parent Info Parent Info is a collaboration between Parent Zone and NCA-CEOP, providing support and guidance for parents from leading experts and organisations. Net Aware Your guide to the social networks your kids use. 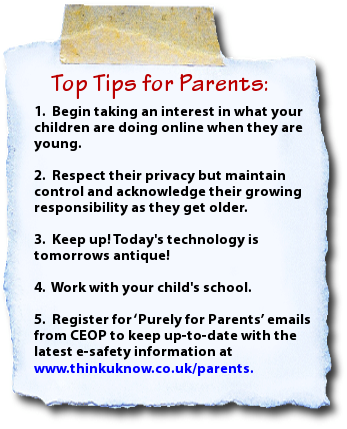 Stay up to date and keep your child safe in today's digital world.